What is Power? Where does it come from, and who really has it? What grants it to those that wield it, brandishing the formless, seething orb with the stealth of the keenest guru? The power of Grayskull? Good fashion sense? A dashingly short moustache and celebrity smile? The color red? What is it exactly that places the supposed powerful at the top of the power-hungry food chain, and when are they removed from said salty pedestal only to be replaced by another? It is an invisible battle of quite abstract yet very human ideas, yet one we are all susceptible to, as it runs rampant and virile throughout the very threads of our society. From our earliest days, these hierarchies plague and organize us, elevate and destroy us, and cause us to analyze why the hell we take ourselves so damn seriously. greets the viewer times ten, each time engulfed in the most saturated red, each time scale-bending your mind and eye as the six foot flawless photographs appear to be much more figurine than statue. Here, form and content marry for the first time within this show and live happily ever after throughout the gallery, somersaulting kaleidoscopically and exponentially throughout the space of the Augen. The smiling face of the great dictator is hooked into a rug on the floor that will be walked across, and his heroic figure has been painted on a set of China (double ha!) atop which hamburgers and fried chicken props are placed. Greasy leftovers upon such historically sacred ground are dangerously imminent. Riswold understands his audience as well as his maniacal subjects did. Next to each piece, he adds the element of written text that mirrors the ideas behind his images. Coincidentally, the language of political manifesto and advertising are combined, suddenly existing on the same plane. By doing so, Mao's words are a ridiculous sales pitch, contradictory to themselves and blatantly wanting something from their targets. Once again, context is everything. Working in the veins of Pop Art and Warhol, Cervantes, Kubrick, Goya, the creators of South Park and Team America to name a few, Riswold satirizes language and rearranges contexts to displace accepted hierarchies and monsters and remind us why we might even want to step on the American flag occasionally to keep ourselves in check. There is imminent danger in not having work like Riswold's around. He warns us not to forget to question, to make fun, to take the power out of that which declares itself powerful. However, one cannot help but wonder why such a culturally savvy and politically interested artist such as Riswold chooses only to deal with such dated subjects. So much of the weight of the purposeful displacement of these figures is lost in the context of history, which Riswold cannot entirely remove. Their atrocities, while merciless and awful, are distant, and thus, while Mao's image was once sacred, is (at least in the U.S.) not nearly so any longer. The work gambles with the icons of horror that may be too hackneyed to serve up the punch Riswold is seeking and, while conceptually and formally sound, breaks no ground. 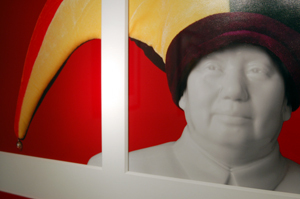 It is well known that artists in China were required to paint Mao with certain colors, and could only depict him as a hale, robust man. Artists began to stray from these requirements, probably at great personal and familial peril. I saw an exhibition of a group of Chinese artists in Salina, Kansas, at the Salina Art Center of all places, that were doing just this. 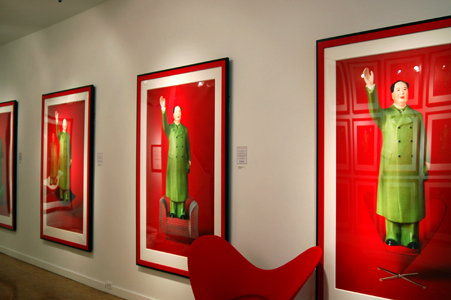 These works had tremendous impact because of the risk involved and the fact that Mao affected their lives every day. The weight of history was on their side. Not only is the "weight of the purposeful displacement... lost in the context of history," but the weight Riswold probably wanted didn't exist in the first place because of his relationship, or lack thereof, to Mao. I don't really get why Riswold chose Mao when there are far more personally relevant tyrants to satirize. Well, China as an economic superpower is the big topic for this century so I suspect Riswold is playing off the old 20th century stereotypes of Mao and modernism to be purposefully anachronistic. The show also seems to be an installation ... not just a series of individual pieces, also communistic.